This is a deathmatch; whichever faction is the last standing wins. Alliances do not count. Backstab rules are in effect. For each turn an alliance exists, it gets 2 backstab dice for each team in the alliance. When you decide to betray your allies, you can add the backstab dice to accuracy, armor, or defense rolls against your former allies. When a faction is down to a single minifig left on the field, that minifig gains Heroic stats. I'm applying response actions fairly liberally -- if a minifig has not taken an action during his turn, he can make a response attack on his opponent's turn. 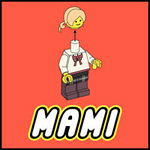 Minifigs can only make response attacks on enemy units within their cone of vision, which extends 45 degrees on either side of the direction they're facing. Vehicle armor is weaker in the back than on the sides, top, or bottom. 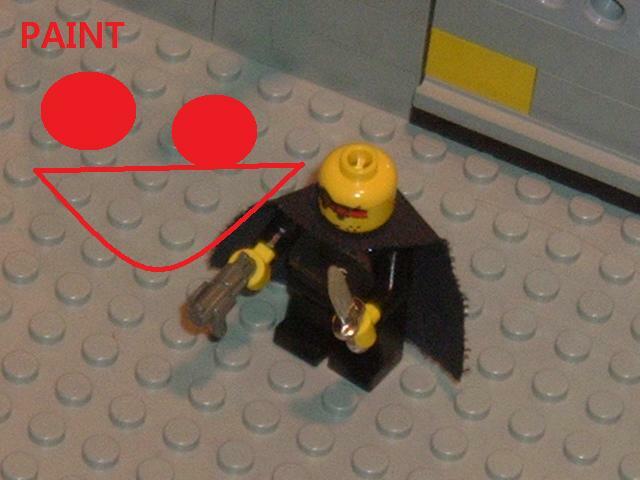 Minifig explosive weapons have infinite ammo, but vehicle explosive weapons have limited ammo. The red marks show the locations of pickup crates; each crate contains an artifact from pre-apocalypse civilization which may be useful to your team. The arrow shows a crate which is behind the fort. The Honda-Ziplok Clan is a generic post-apoc faction I use whenever I need a vague backstory for a Post-Apoc creation. 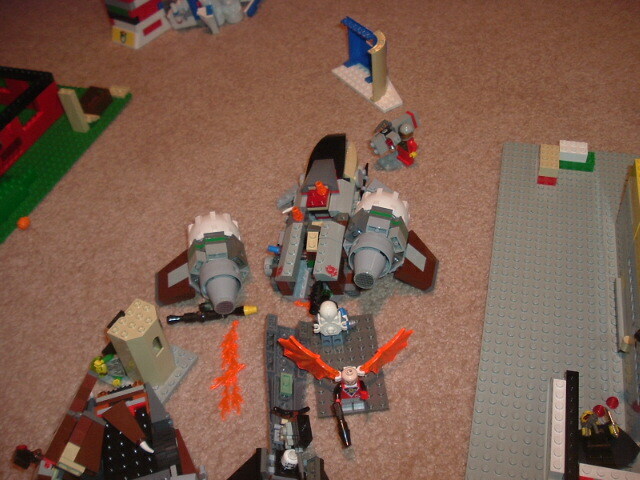 Here they are -- eight ground troops, a rocket-launcher tank, and a VTOL. 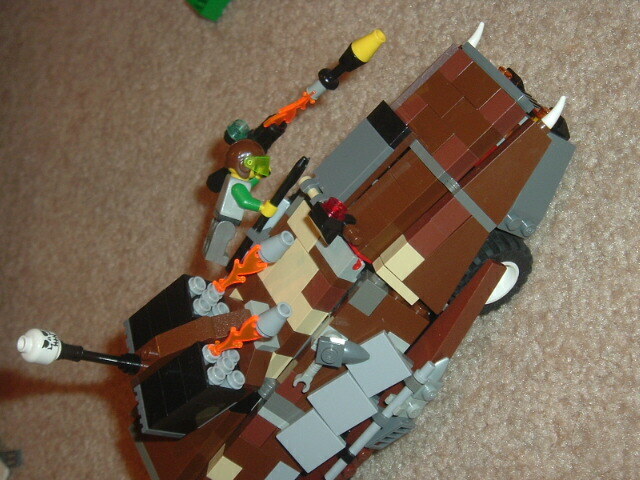 The tank can carry 3 passengers, the VTOL only one. Closeup of the infantry. 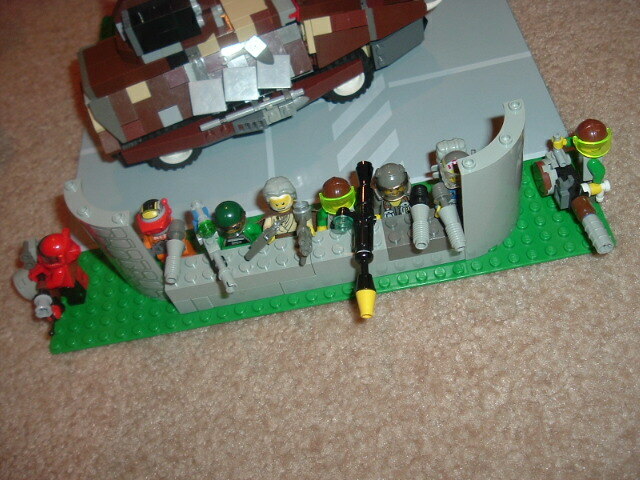 Left to right: Flamethrower trooper, rifleman, heavy machine gun trooper, Hero (a Priest-Mechanic who can use his stupendous feat to heal minifigs or repair vehicles), Bazooka trooper, two more riflemen, and a minigun trooper. The Nomad Raiders cross the desert on giant Landships to prey on small towns like this one. Their vehicle has two gun turrets -- one with a flamethrower and two MKII guns, and one with four MKII missiles and two MKII guns. 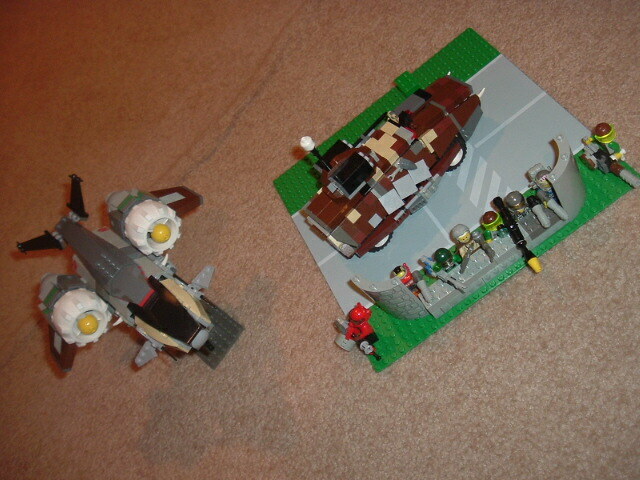 Each turret comes with its own gunner. 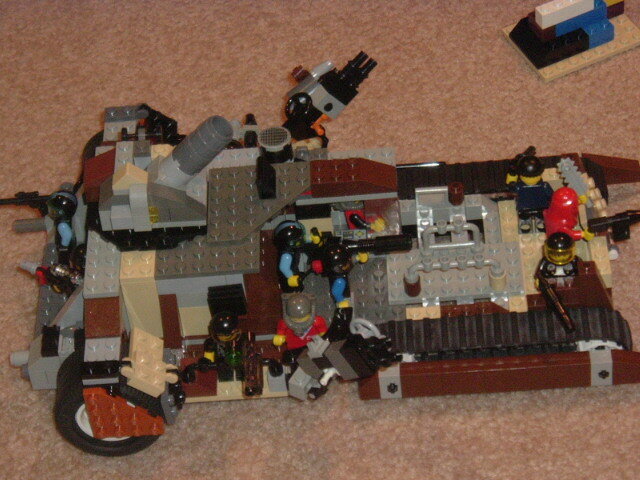 In addition, it has an MKIII artillery cannon controlled from the cockpit. The Raiders have five riflemen, one heavy machine gun trooper, one bazooka trooper, one minigun trooper, one flamethrower trooper, and one hero. 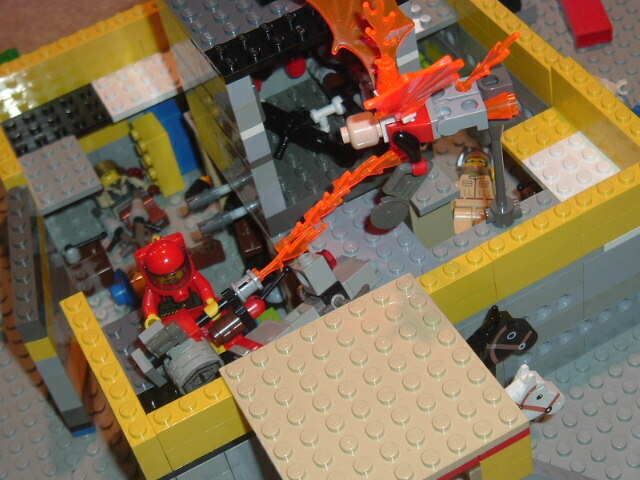 Their hero (wearing red) is a Priest-Mechanic like mine, armed with a chainsaw and SMG. (SMGs have shorter range than rifles but are easier to fire in automatic mode). The Zombies and Mutants have the largest number of infantrymen -- six spear-toting zombies, two Skeletons with Flails, two Peaches with primitive bows, and a Dimmy hero with a sword and blaster. The Dimmy can use his Heroic feat to infect other troopers. 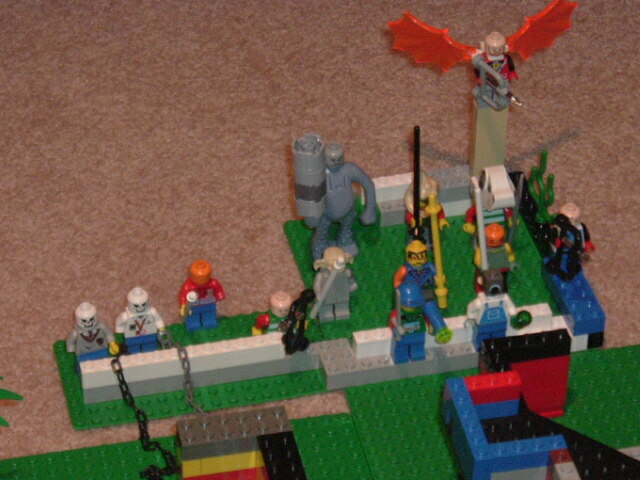 The zombies also have a Troll with a club, a Grenade trooper (the one with the grey block head) which throws bio-explosive bombs, and a Winged Peach with a bow and arrow. The Zombies aren't intelligent enough to use infantry weapons at the start of the game, but they can eat the brains of dead infantrymen to learn how to use their weapons. At the end of each turn, I'll roll 1D6 for each dead zombie on the field; if I roll a 5 or higher, that zombie comes back to life. If a zombie fails a resurrection roll 3 times or more, it is permanently dead. Zombies can also be permanently killed by flamethrowers or chainsaws. The Survivalists occupy the fort in the middle of the field. 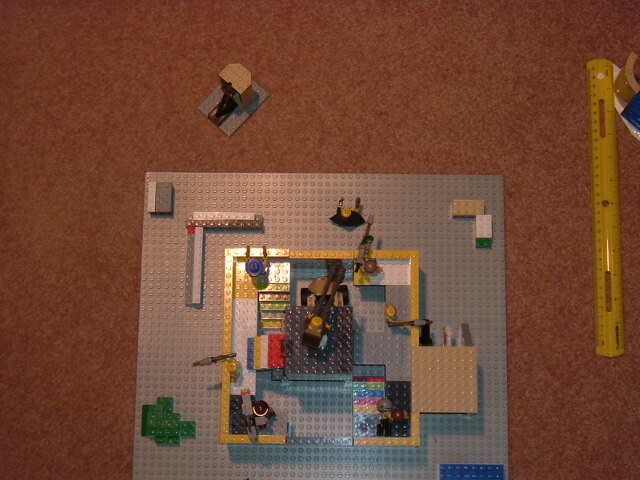 Their Hero, a Priest-Mechanic, is the one in the blue hat with the 2 pistols. All of the Survivalists have the Piloting ability; there's a small buggy inside the fort and two horses in the stable just outside it. The fort has an anti-tank gun turret on top of the central tower. The fort has 2 doors, which are opened by switches on the inside of each door. The Survivalists have two riflemen, one flamethrower trooper, one person with a sniper rifle (sniper rifles are much easier to fire if you stand still) and one with a grenade launcher -- a weapon capable of auto-firing up to 3 MKI grenades. The Survivalists also have a Stealth trooper just outside the walls. The player with the Stealth trooper can use MS paint or some similar program and an Overwatch of the field with a ruler for scale to navigate in stealth. (Just grab the ruler and move/rotate it to plot your course. The "rotate" command can be found in the Image button at the top of the MS Paint screen) You don't need to show the pictures to me). The Stealth ability requires an Action, so you need to leave stealth to attack. Also, it has a UR of 3 -- I'll roll at the end of each turn to see if the Stealth trooper can enter stealth next turn. He can enter stealth on turn 1. He's armed with a poisoned knife and SMG. Because of the stealth trooper, you need to have MS paint to play this team. Use MS Paint to edit and send a random picture along with your signup post. The Survivalists also have an armory in the middle of the fort. 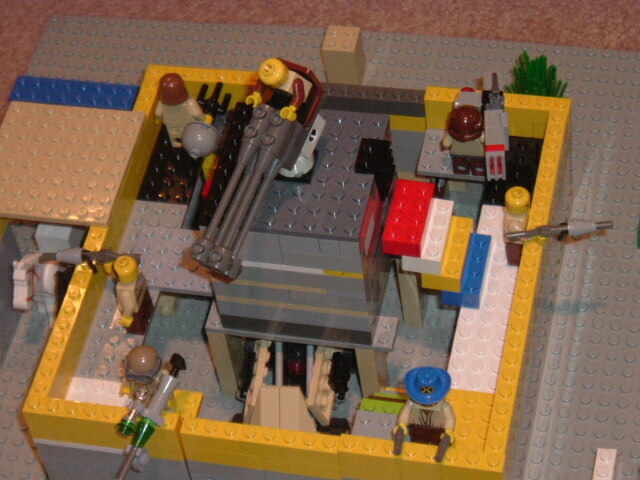 The picture doesn't give you a good idea of what's in there, but there are 2 chainsaws, 2 heavy machine guns, a flamethrower, a bazooka, and a minigun. While the armory gives the Survivalists a lot of firepower, it also makes them a tempting target for the other players. We have a small mystery faction which will drop in during the game. I'll PM you with details once you sign up. Last edited by Theblackdog on Sat Mar 07, 2009 8:26 am, edited 11 times in total. Last edited by Moronstudios on Mon Jan 26, 2009 9:03 pm, edited 1 time in total. ooh! ooh! i like brains! 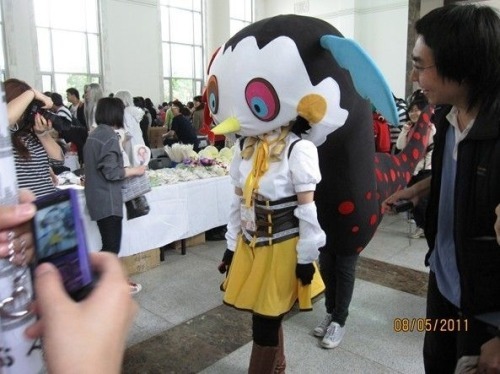 H-Z Clan is my army. Sorry for not making that clear. But I'll reserve the mystery faction until you say yes or no to that. Moron, you need to put up a picture to show that you have an image-editing program; you'll need one to keep track of your stealth trooper. I've updated the thread with turn order and more info on the Survivalists' weapons. 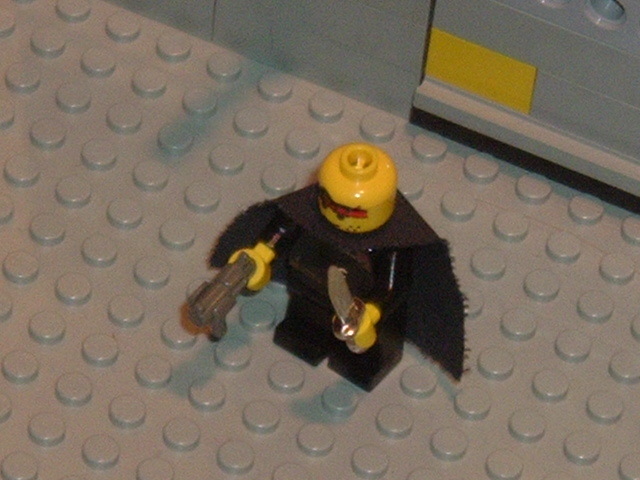 They have some special minifig weapons that the other sides don't, so you should read up on them. Theblackdog wrote: Moron, you need to put up a picture to show that you have an image-editing program; you'll need one to keep track of your stealth trooper. OK, so we have Silvadream for Nomads, Moronstudios for Survivalists, and Birdman for Zombies. Massam, I've reserved the Mystery Faction for you. You can decide whether or not you want it, and if you don't I'll give it to someone else. If you want that team, go ahead and start sending in orders. The rest of you can start sending orders as well. Signup is technically not locked, but new arrivals have next to no chance of getting in. I'll be mystery faction. As long as it doesn't involve paint. It does not. Signup is now LOCKED. I'll PM you with pictures of your team. EDIT: Still waiting on Birdman for orders. Last edited by Theblackdog on Tue Jan 27, 2009 3:01 pm, edited 1 time in total. Always post these things when I go to my lego room, don't they? Looks good, wish i had got here. If anyone drops out, Im in please! 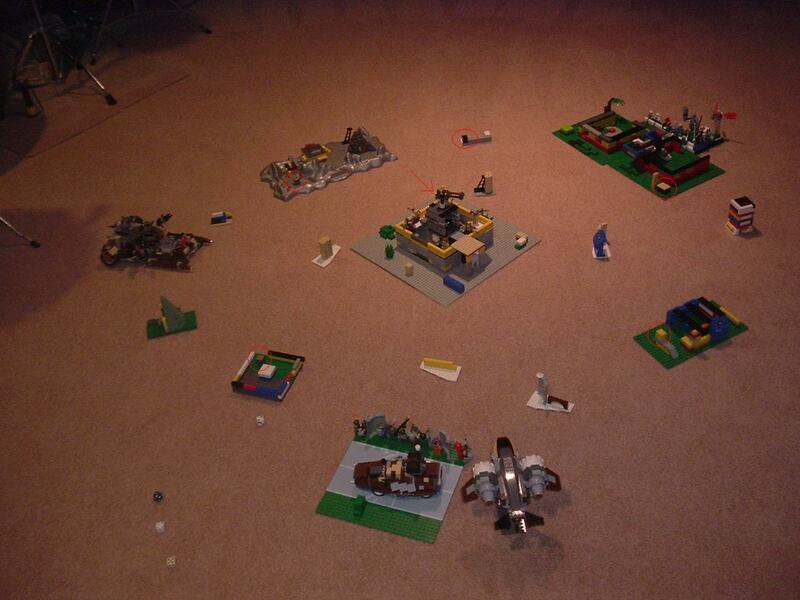 Here is an Overwatch of the battlefield which Moron can use to guide his stealth trooper around. The stealth trooper has to become visible before he can leave this area. 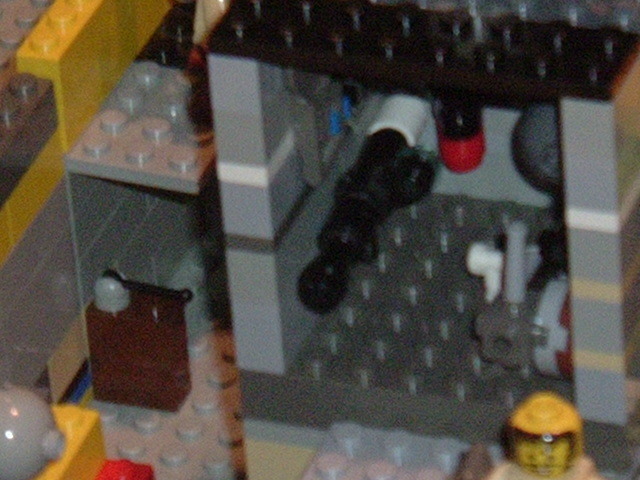 You can see one of the pickup crates in the upper left corner of the gray baseplate. The stealth trooper moves 5" per turn. I'm still waiting on Birdman for orders. *EDIT*: Since Silvadream was banned, the Nomad Raiders are now controlled by Jifel. Signup is CLOSED yet again. Top Thread will be welcome.